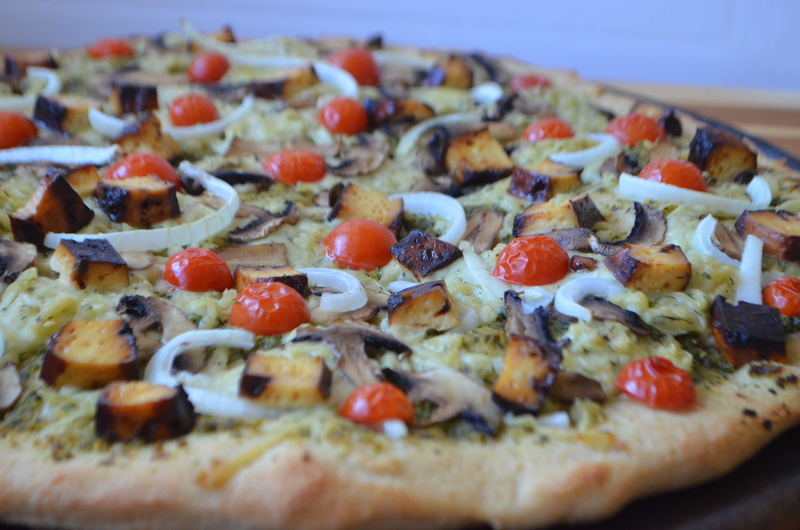 There’s a million recipes for pizza dough online, so why would you care about this one? It’s not even a no-knead, 30 minutes and it’s ready dough. You actually have to give it time to proof and wait for the yeast to bubble. So I don’t know why you’d ever pick this specific dough recipe to pin, but I’ve been making it every Friday for years. It’s a pretty solid recipe, especially if you like thick crust. I usually start making my dough a few hours before I make the pizza to give it plenty of time to rise, but you could probably start this an hour before and be fine. I used to make mine by hand; now I use a dough hook on my food processor. It’s much faster, but making it by hand is still the most basic and effective method. Add flour, salt, and oil. Knead in food processor for 3-5 minutes, or knead for about 5-8 minutes on a floured surface, adding more flour as you go. If you don’t know how to knead dough, look it up on youtube. It’s pretty simple. If your palms start to stick, flour them. 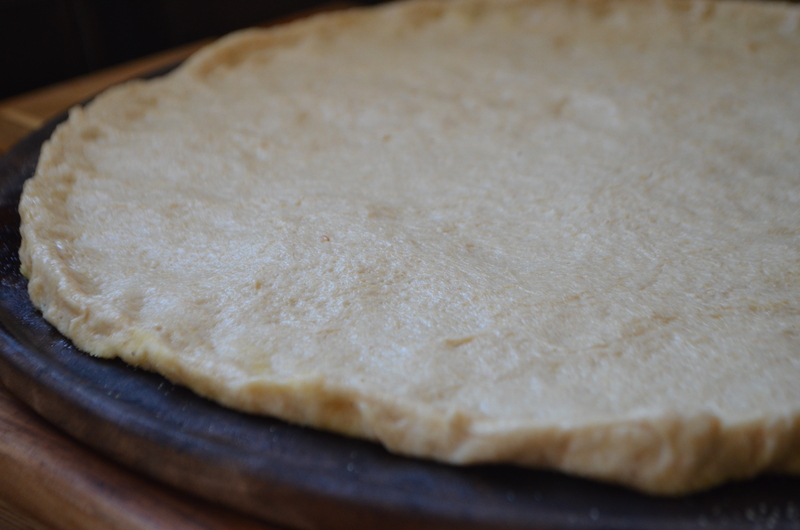 Right now the dough is in a baby stage, but you want to knead it to form the gluten that makes for a chewy crust. Once it starts rebelling and pulling against you (the teenage phase) you know it’s ready. Form into a ball (I gather the loose ends and pinch at the bottom) coat in olive oil, and send your teenage dough off to college. Leave in a bowl and cover with a damp towel for about 30-60 minutes. When your dough comes back from college and looks like it’s gained it’s freshman 50 (as in, it’s doubled in size) it’s time to roll out into a crust. Or, alternatively, you can knead it again and let it rise again. If you get tired of letting it rise, you can toss it in the fridge. 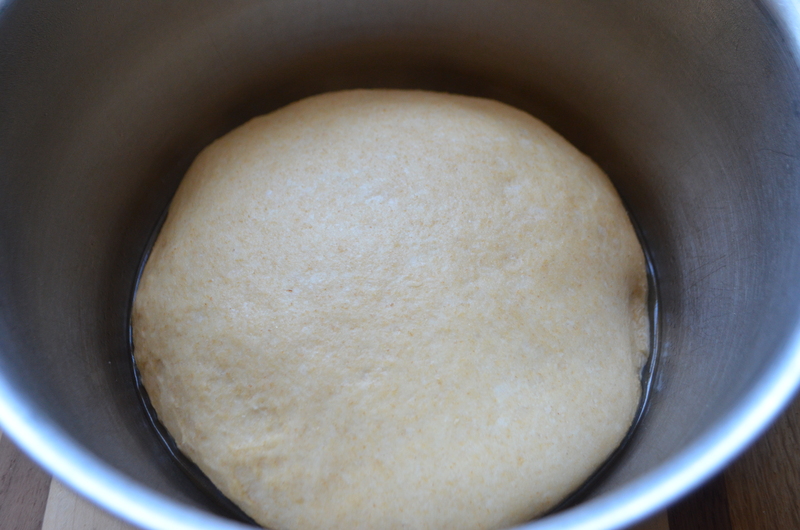 The refrigeration slows the growth of the yeast, so remember to pull it out about an hour before you cook it. Preheat your oven to 475°F. 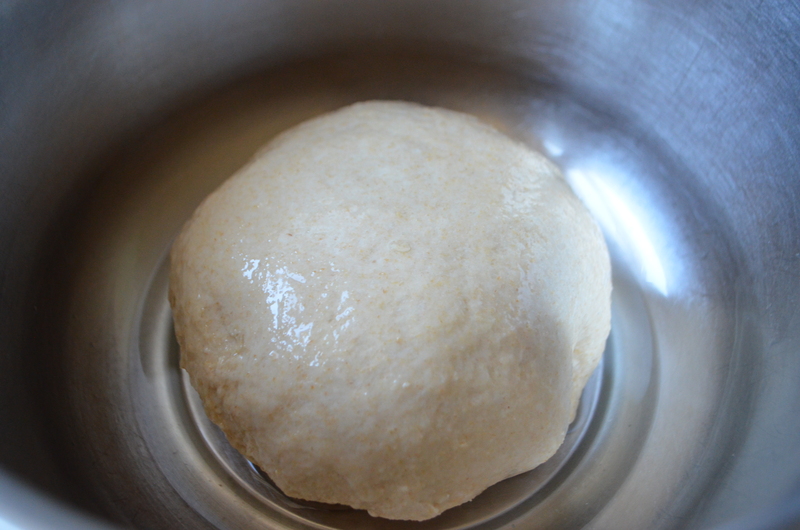 When you feel like your dough is ready, grease and flour a pan. Or a pizza stone. 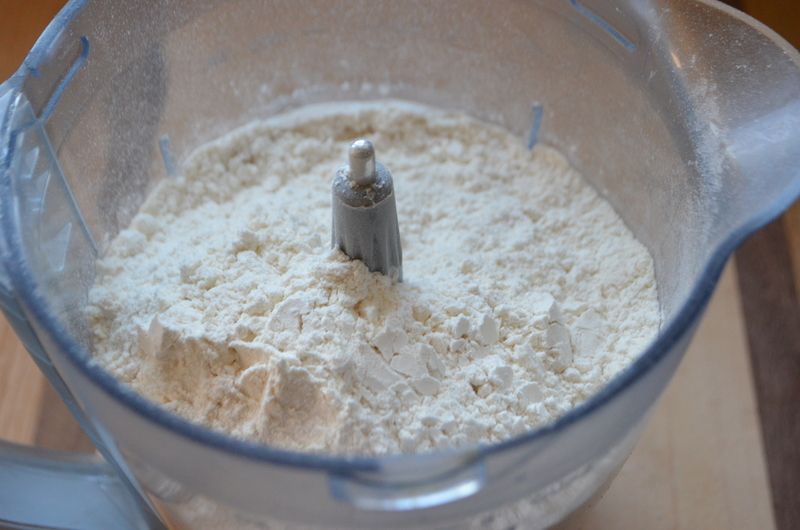 Or instead of flour, use semolina or cornmeal. Any of the above will result in a delicious pizza. Roll out using a rolling pin or stretch and toss for a more “hand tossed” look. Sometimes I just grab the edges of the dough and let gravity do the work. When it’s stretched to your liking, coat with a thin layer of olive oil. Sometimes I add fresh minced garlic here or extra herbs. Use your hands! Top with your favorite sauce. I go between marinara, barbeque, and a caramelized onion sauce. 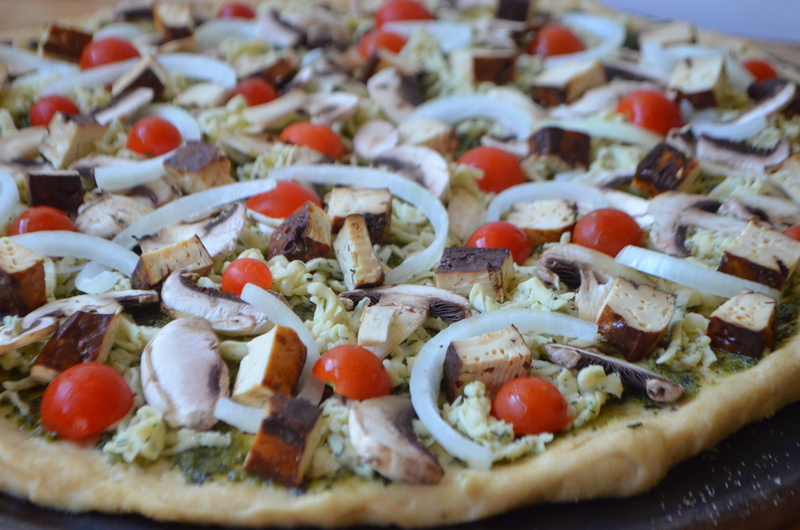 Add toppings-vegan cheese, basil, fresh garlic, onions, mushrooms, pineapple, seitan, anything you desire. Bake about 12-15 minutes, checking for browning around the edges. I like my pizza little under cooked, so I pull mine out around 12 minutes. Im hungry and heading back to my pizza restaurant now! Looks great! My daughter is newly vegan and we have been really been getting into helping her eat healthy. I ran into a friend of your’s that works at in Stockton, IL at a bank. She told be all about your blog and I love it. I am new to blogs and would like to know all about how you make your own cheese? If you don’t mind. Thank you.